10,000ft gives creative organizations and their thinkers a big-picture view of their business, teams, and projects. 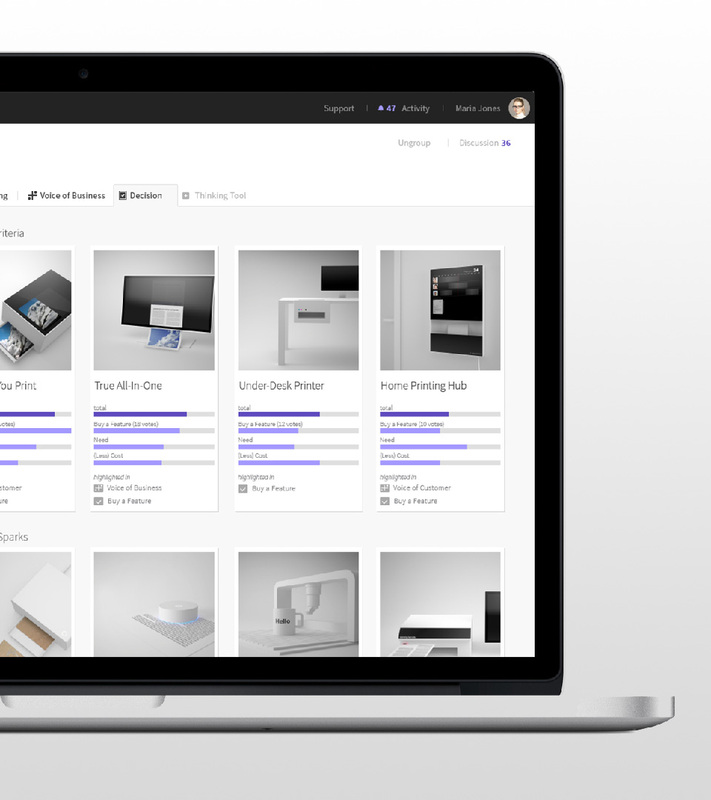 Managing workflow and resources is a challenge for any creative company, Artefact included. 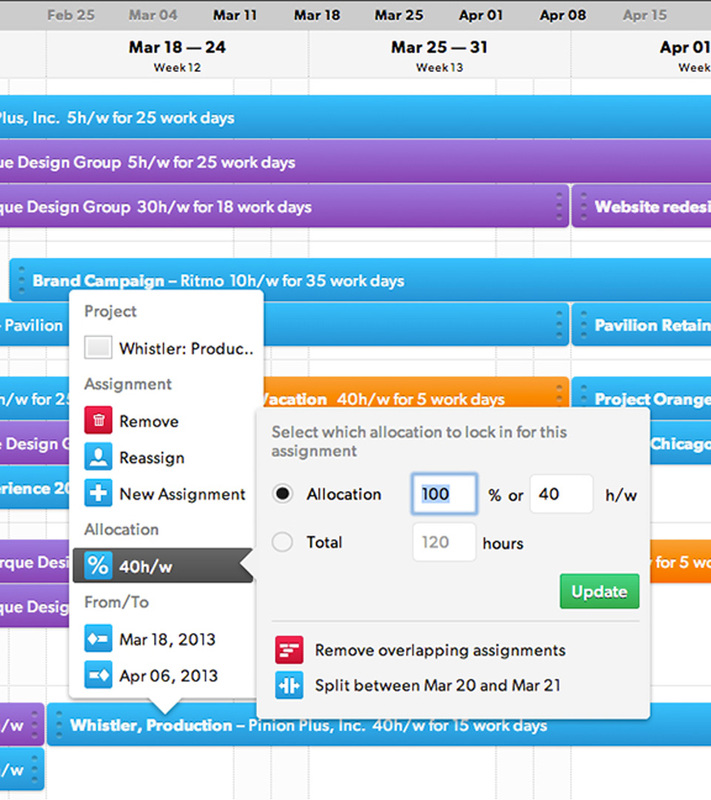 When we couldn’t find a simple and efficient tool for resource planning, painless time tracking, and organizing our ideas, we decided to build one. 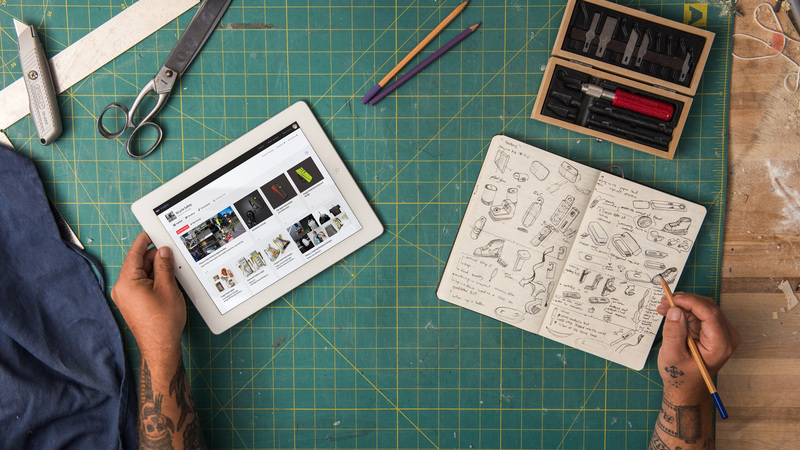 10,000ft is a design-inspired visual resource collaboration tool. It allows dynamic organizations – and the creative thinkers they employ – to get a big-picture view of their business, teams, and projects. It also enables easy collecting and sharing of ideas in a unified project space called 10,000ft Insights, which facilitates timely and relevant feedback and helps organizations share and retain knowledge across disciplines. 10,000ft and 10,000ft Insights promote autonomy, independence, and a unique ability to make real-time strategic decisions based on complex data, which ultimately leads to more opportunities to innovate. To sign up for your free project, visit www.10000ft.com. In the ever-changing environment of teams, people, and projects, we constantly have to make strategic decisions on the fly. Faced with the reoccurring need to adjust plans, reshuffle priorities, or reassign employees, we created a way to capture the big picture of what makes our business successful. We also established better insight into available resources, utilization, and projected workloads, while keeping our projects profitable and on time, and our creative workers independent and autonomous. 10,000ft addresses all of your project pipeline planning and day-to-day operational needs. 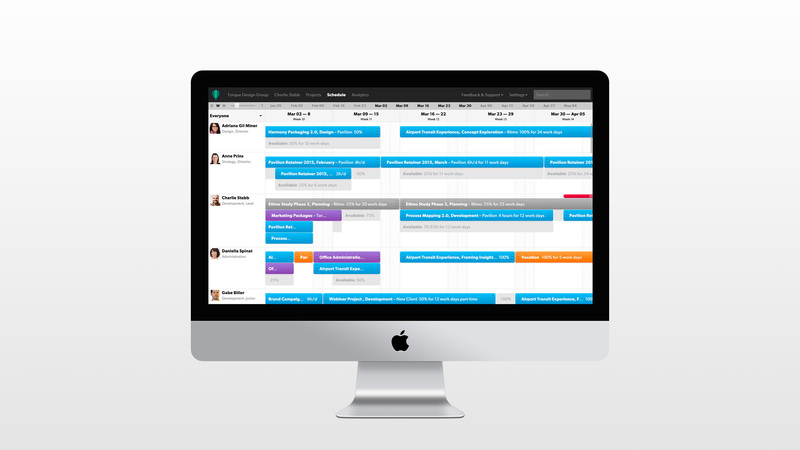 A simple, dynamic, and visual interface features drag and drop interactions, visual controls, and requires minimal data entry for easy resourcing, scheduling, and forecasting. 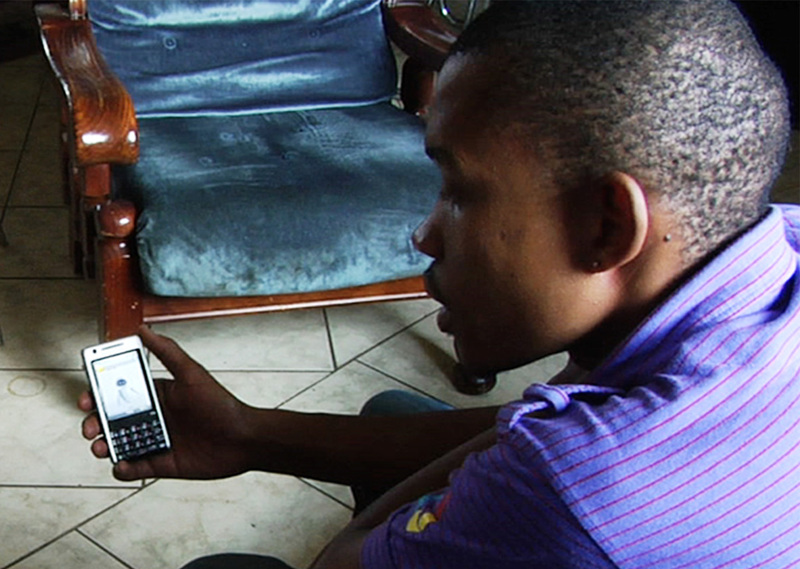 Personalized information helps individuals make decisions autonomously while remaining accountable to the organization. 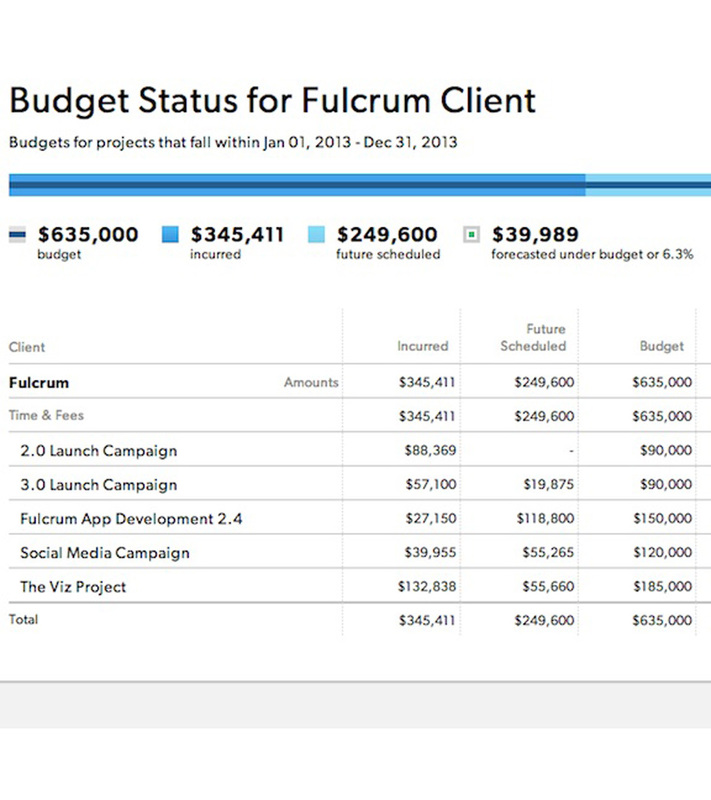 Real-time project statuses show the impact of scope and resource adjustments. Changes are recorded in an activity feed for decentralized decision-making. 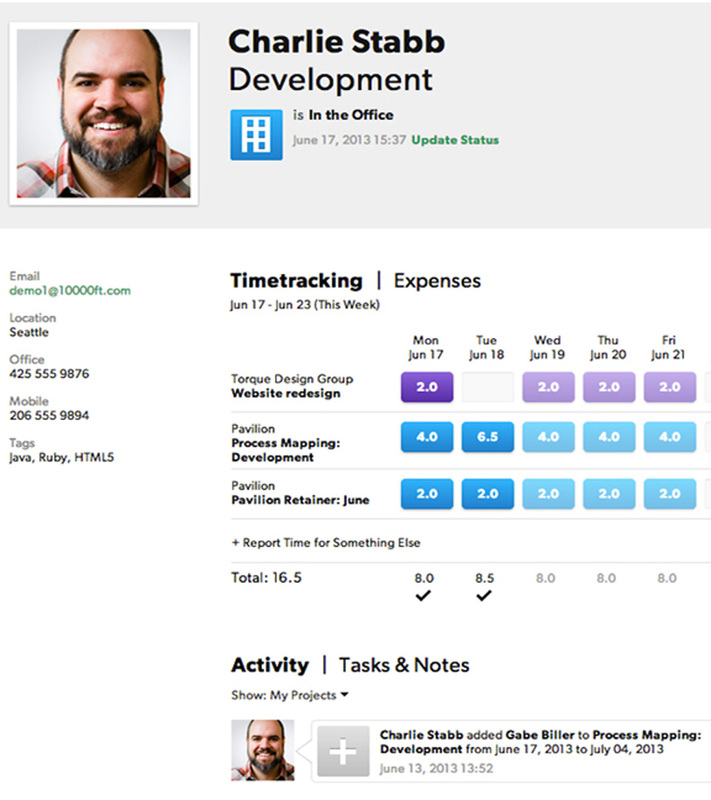 Personalized pages for team members display time-per-project. 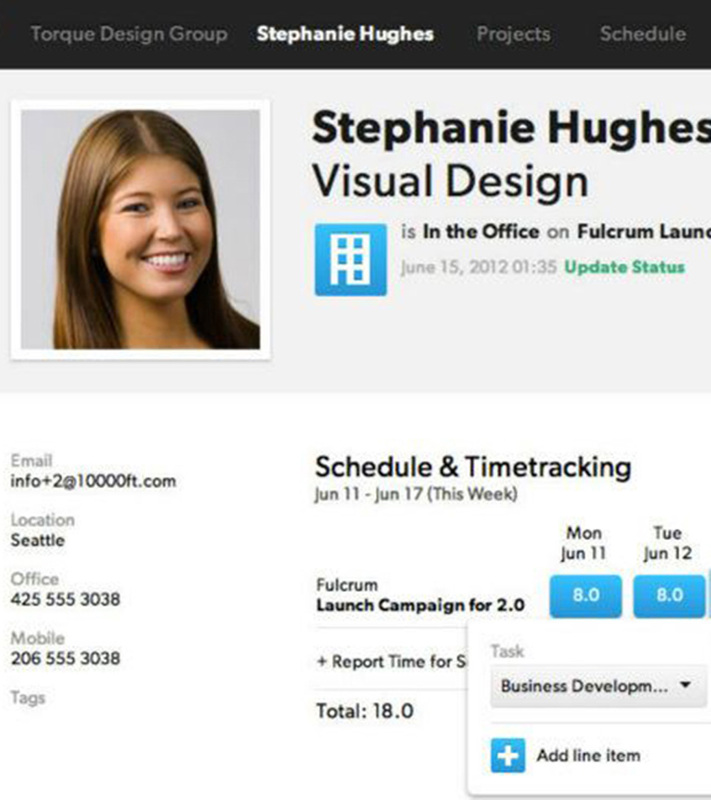 An innovative time-tracking experience requires users to simply confirm time. Instant analytics and reports that can be customized in a few clicks without the need to program formulas. 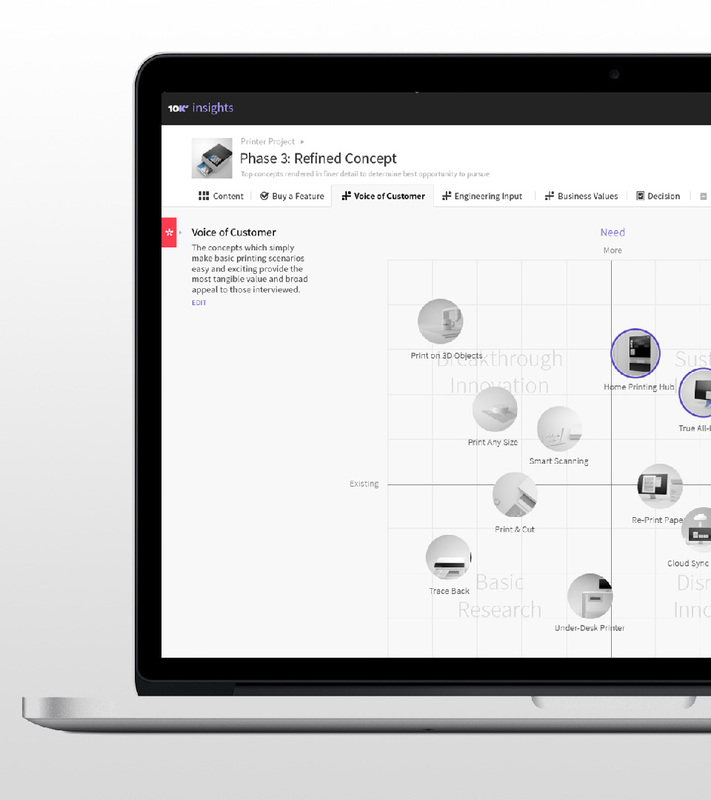 10,000ft Insights consists of sparks, groups, and projects that give you the ability to dive into the details of specific ideas or look at the project’s big picture, depending on your role on the team. 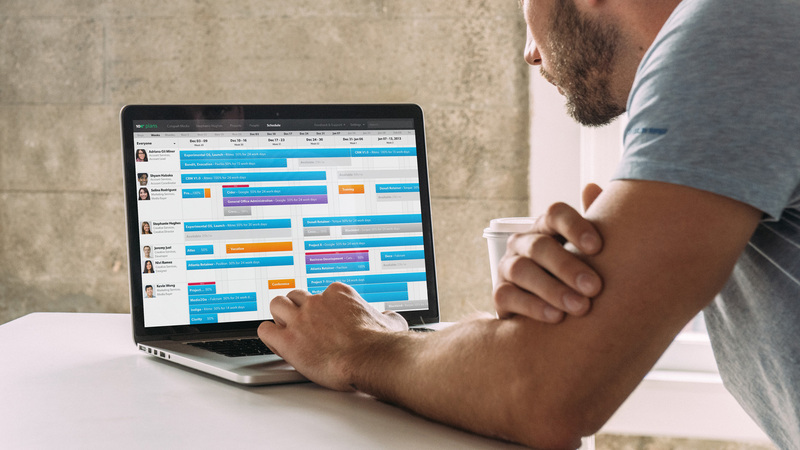 Designed to support seamless grouping and organization, as well as commenting on every level, the tool adds structure to your process by grouping similar ideas or related insights together, regardless of their source. 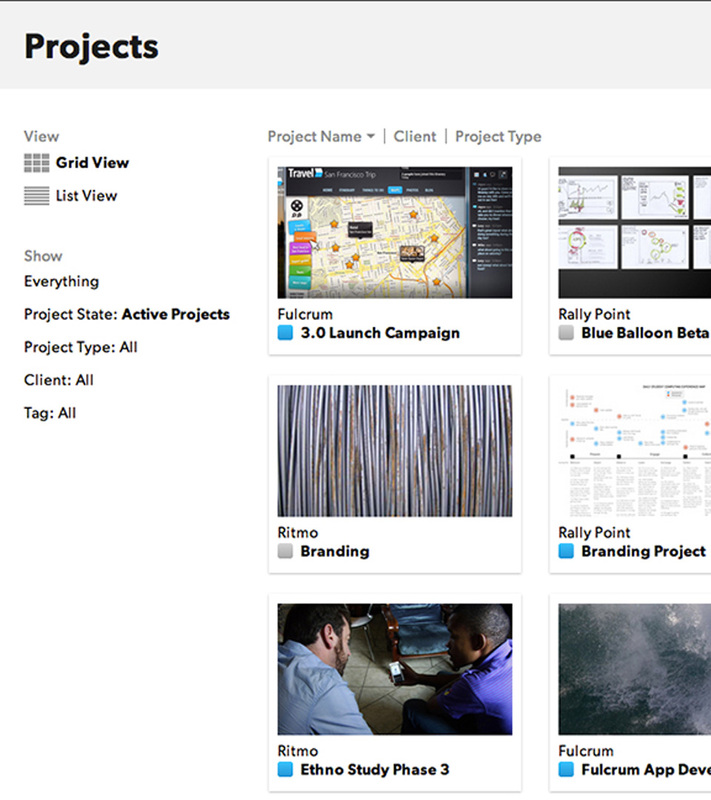 No more searching for files and folders, slides and decks, photos of whiteboard brainstorms or emails. Strengthen collaboration for confident decision-making. Each of the 10,000ft Insights analysis tools generates data that can be visualized to quickly understand the impact of everyone’s input. As a result, you can make objective decisions based on meaningful, even subjective input – requirements, feedback, principles, or values. More importantly, you can clearly communicate the rationale of your decision to other stakeholders or clients. Recording the thinking behind every micro-decision along the way allows you to revisit decisions or quickly bring new team members, internal or external, up to speed. Easily add, group, and comment on files, notes, images, and other project content to create a collaborative space for teams to share insights and perspectives. Capture input from people with different areas of expertise. By layering multiple tools on top of each other, you can create a balanced perspective of the problem or challenge and ensure that everyone’s contribution is considered. 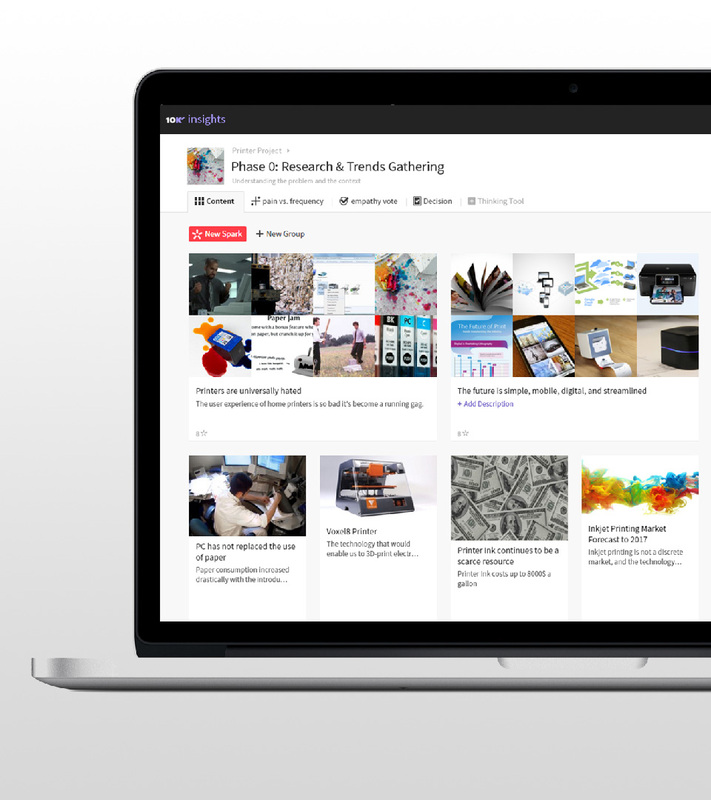 Analyze your ideas and content by choosing from a gallery of design thinking tools like feature prioritization, voting, and SWOT analysis. Visually synthesize the group’s process and analysis to help stakeholders understand the impact of everyone’s input and evaluate alternative scenarios based on shifting priorities. 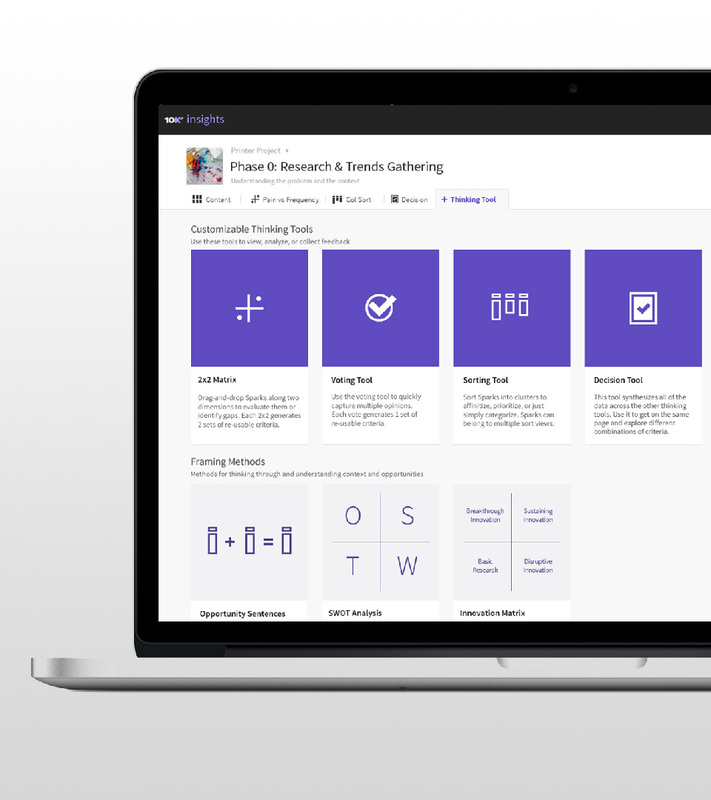 10,000ft and 10,000ft Insights help you plan and deliver stronger collaboration between teams, clarity and transparency in the design process, and ultimately, achieve decisions, direction, and success with confidence.